Looking for a contractor that cares? We do. We get it. We’re all in this together. Choosing high efficiency heating and cooling products that use less energy has benefits for us all. That is why we offer the best manufacturer’s our industry has to offer. Leading edge products by premier manufacturer’s like Coleman, Lennox and Daikin AC. The energy used in the average house is responsible for twice as many greenhouse gas emissions as the average car. When power plants burn fossil fuels to make electricity, they release greenhouse gases. By using less energy at home, you help reduce the emissions that contribute to global warming. When you are deciding on your home’s heating, ventilation and air conditioning (HVAC) system, the decision you make can have a big effect on your utility bills AND your comfort. 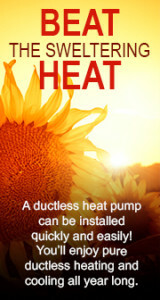 Choosing a high-efficiency heat pump, furnace, air conditioner or ductless heat pump is a wise decision. You’ll get short term benefits like great comfort and enjoy the long term benefits of reduced energy bills! It’s a win/win. Count on us to make sure to help you choose the best heating and cooling equipment for your home. We’ll install it properly and make sure that you get the most out of your new system. We’re here for you. Call us today at 253.539.1424.